If you have recently upgraded your Mac RAM, or if you are experiencing strange system crashes, it’s a good idea to test your memory modules integrity using a free tool called memtest. Essentially, memtest is a utility designed to stress test RAM for errors. Without getting overly technical in the explanation, memtest works by writing random data to the RAM, then verifying that the data written to the RAM is readable and without conflict. If errors are detected using this method, it typically means there is a faulty memory module, and that’s why memtest is such a valuable tool. Though it’s technical in nature, it’s quite easy to use, so let’s begin. The above link downloads a zipped package installer that simply places the memtest port in /usr/bin and does nothing else. This will immediately launch memtest, testing all modules twice (thus why the 2 is attached to the command). You can specify another number of tests to perform by replacing that, but two is fairly standard if you aren’t experiencing anything unusual. Without specifying a number of passes at the end, the app run a long time but can be stopped any time by hitting Control+C in the terminal window. Letting memtest run a while will consume a lot of CPU cycles so if you’re going to run the utility on a Mac laptop be sure to plug it in first. If any errors are reported, memtest will let you know. Likewise, if you run memtest and the utility freezes or crashes, that’s a pretty good indicator that your RAM is bad. If you’re running the test and you encounter any errors or freezes, you should return the memory modules to the place of purchase and get a replacement. I’ve used this utility for a while now and never run into any problems with Mac RAM, but it does happen from time to time. If you have recently bought an upgrade it’s always a good idea to use this app to verify that what you bought is trouble-free. 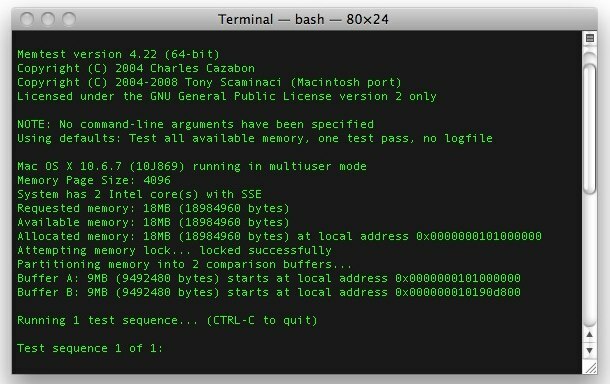 You can read a bit more about this memtest for Mac port at Command-Tab.com. Testing RAM with memtest should be considered part of a multi-step process of performing general system tests. This should also include running Disk Utility to check hard disk health which is done by verifying hard drive functionality and repairing any problems that are found, and also performing a general stress test on the processor and fans by placing a Mac under heavy load. These are all decent methods to perform general system testing, and are particularly worthwhile to do after upgrading elements like RAM or a hard disk, or replacing hardware, whether for troubleshooting purposes or as part of an upgrade path. Good article, thanks, and helped me solve my Macbook crashes OSX 10.6.8. However, I downloaded Memtest from SourceForge AppleJack project. Nice thing is the Readme file gave more info, a better user interface for dummies like me AND you get the other Applejack utilities – all for free. They are already working on a Lion version. I’m testing a 16GB machine and also have the same “memory page size”. This is just the size of the memory chunks that get paged in and out, in bytes. A couple of lines down you should see “Requested memory:”/”Available memory:”/”Allocated memory:”. This is the amount of memory not in use already that is going to get tested. Mine is 12934MB. How reliable is memtest? I just upgrade to 16GB for my 2011 Oct Mac Mini and memtest failed 1 out of 3 loops due to “FAILURE! Data mismatch at local BUFA address”. 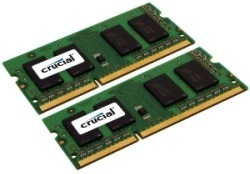 I’m wondering if I should RMA the 16GB memory sticks? Try to reboot with the Apple Hardware Test to confirm as well, but if you continue to get memory errors you should probably get them swapped out. Sometimes memory works, but you will run into random crashes and problems with the computer, personally if my memory and hardware tests kept failing, I would swap them out. I bought and installed 16GB upgrade to my MB Pro. The memtest has so far passed 9 out of 10 times. The only one error I received (at the second iteration) was in the Checkerboard, failure at 60, all other times it’s gone through flawlessly. Not sure if I should be concerned. Correct me if I’m wrong, but isn’t the maximum memory capacity of MBP 8 gigs? The “official” word from Apple is that the MBP line only accepts 8GB. However, according to numerous sources – and confirmed installations – it can actually handle up to 16GB. If it’s any indication, both Crucial and Macsales (OWC) confirm this when you use their system specific memory selectors. I just updated my 2009 MBP (2.6GHz Core Duo) to 8GB from 2GB. Apple and Crucial both say the limit is 4GB, but the system recognizes the two 4GB modules just fine in About This Mac and System Profiler. However, the computer has been VERY slow lately whenever I’m using more than one app at a time. I’m running memtest right now, and it’s been more than three hours so far, still on this first pass. Is this unusual? It’s not crashing or hanging, just going REALLY slow. It just says “15+ minutes” above, so I’m not sure what a reasonable upper bound would be. Update: approaching the 12 hour mark; test sequence 1 is still underway. Anyone out there? I know its been a while since you posted, but I figured I would answer you. My father has the same 2.6 core 2 duo MBP as well. In the system profiler it shows Macbook Pro 4.1 I believe. In any case, OWC reports this model only takes 6gb of ram, not 8. It will address 8 however it will slow down as you are experiencing… so… sorry you’ll have to downgrade to 6, or 4gb. You should run in single user mode before using on a Mac so it can test more of the memory. Hold command+s when booting your Mac. I ran it on my mid 2011 iMac which I recently increased from 4GB to 8GB and got the following result. If it only checks 6102MB of the 6278MB it found is it possible that problems exist on the parts of memory that isn’t being tested? > on the parts of memory that isn’t being tested? Same question. I’ve gotten crashes and panics throughout the year since I bought a mid-2011 Mini; Genius always blames software; software authors say errors are “all over the place” and blame hardware. Everyone so far says there should be no problem specific to 4+8 = 12 GB. But running them individually doesn’t get the problem. My best guess is — that using 4+8 lets Memtest test a little more of the 8GB card, and that happens to hit the intermittently failing area. But this is logic, aka guessing. And, is there a bootable CD tester out there I can use that would work on a mid-2011 Mini (using a 3rd party external USB CD drive)? I tried the Memtest-86 CD, but that doesn’t work on the Mac (esc doesn’t exit, and using esc suddenly reports multiple errors). After some Internet research I have found out that you have to start up your Mac in Single Mode to get a reliable MemTest. After doing so my iMac 16 GB RAM was reported 100% functional. By the way, by mistake I put 4×4 GB PC3 10600 RAM modules in my Mac and it works, however in the speed of 1333 MHz. That is much better than the previous 1066 MHz. I have 4GB on my 2009 Mac Book Pro but the allocated memory shown in memtest is 2096mb. Does this mean that 2GB of my memory isn’t working? The one in the article no longer works. Thanks for the heads up, fixed the MemTest link! Problem is with my 2.16GHz Intel Core 2 Duo iMac 5,1 when 2GB RAM is fitted, a line often appears across the main window and in the browser window, plus there can be a Kernel Panic freeze, crash and re-start after audio problems in iPlayer. These problems never happen when a 512KB RAM is in place on its own, but do when both RAMs in place. There is apparently an underlying hardware problem 4SNS/1/40000001:VDOR but this is there whichever RAM is in place and doesn’t seem to be the cause of what is going on. I can’t find anything on the internet yet that says what this problem leads to. I bought the iMac second hand August 2013 knowing there were intermittent problems and the price was OK.
I’ve just completed Memtest with the 2GB RAM in place on its own, and it passed two runs. Both times it said it was ‘full 1089MB’ region. Does this mean only half the RAM is being tested each time? If so, how can I get it fully tested? What happens if fit the 512KB and alongside and run the test? i have upgraded to 16gb macbook pro late 2011 15″. it take more than one hour to finish 2 run. but when it finish, everything was ok. Is it a problem? Is this still useable on a mid 2011 iMac, OS X version 10.9.5? Having problems with it being really slow, and has been in to Apple store due to consistent sleep wake failure restarts that are still occurring after they have replaced everything except the memory and hard disk. They replace power supply, logic board and graphics card. But computer still intermittently restarts itself, always being sleep wake failure problem. Have checked activity monitor and have red and yellow in the memory graph area. Am a total computer dummy so don’t know what to do. HELP! Thanks for the article. Alas, I don’t see any instructions on other applications allowed to run during the test. Does it make any difference? Also, do I have to remove all external drives form my Macbook while running it? And should a decent memory test not be run from a boot menu, with few as possible services loaded? Finally, is it possible to get a list of most common errors and possible fixes? Such instructions would really complete the article. The link has been updated as well, the download for memtest for Mac should work fine now. Runs great in MacOS Sierra by the way! I tried to install it on OS X El Capitan 10.11.5 and says it´s not compatible with this OS, how you could even installed in MacOS Sierra???? It should work in El Capitan. Memtest works in Mac Sierra for me but all Macs are soldered with RAM now so it is less useful today. You could use Apple Diagnostics test instead to test memory. Thanks! I will do that. Nevertheless my machine is a MacBook Pro 15″ mid 2010, I upgrade the RAM to 8 GB, so when I try to install Memtest it pops a window that says the software is not compatible, it appears I need v. 4.23. Don’t understand why I can’t use v 4.22. I just confirmed this, works great in Mac OS El Cap and 10.12. Hello, this does not work in El Capitain 10.11.5. Will try Apple Diagnostics. Does it still work with OS X? I ran the memtest twice, and twice it froze my computer, I had to force shut down.